Arizona State was down by as many as eight in the second half. 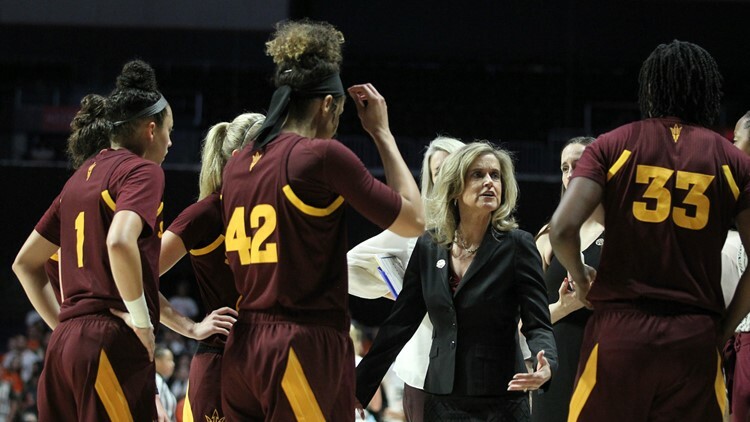 CORAL GABLES, Fla. (AP) — Robbi Ryan's free throws with 5.0 seconds left off a Hurricanes turnover put Arizona State ahead to stay, and the fifth-seeded Sun Devils ousted fourth-seeded Miami 57-55 in a second-round Portland Region game on Sunday night. Miami's last chance went to senior Emese Hof, who got a good look and had her final attempt from the right block bounce off the rim as time expired. Arizona State started quickly, running out to a 9-2 lead and stayed out front for much of the first half. But the Sun Devils went into the break down 28-26 after Endia Banks' jumper for Miami with 16 seconds left in the half. And that wasn't their only issue. Starting center Charnea Johnson-Chapman was fouled and came down hard on her left elbow with 0.9 seconds left in the half. She wasn't able to take the free throws, Ruden came on and missed both, and the deficit stayed two going into intermission. Meanwhile, Miami's defense helped extend the lead a bit to open the third. The Hurricanes held Arizona State scoreless for the first 4:08 of the third quarter, pushing the lead out to 34-26 before Courtney Ekmark's 3-pointer ended the Sun Devils' drought. Arizona State: The Sun Devils are 4-0 all-time against Miami — winning by four, two, four and two points respectively. ... Arizona State used the same starting lineup for the 61st consecutive game, going back to last season. ... Ekmark's two 3s gave her 66 for the season, second-best in Arizona State history. ... The timing of Johnson-Chapman getting shaken up was fortunate for Arizona State. She started the second half after getting treated at the break, so she missed only the 0.9 seconds of game time. Miami: Mompremier became the 15th Division I women's player this season to record multiple 20-rebound games. She had 15 by halftime, while Arizona State's entire roster had 19 at that point. ... Hof is the second Miami women's player to play in four NCAA Tournaments with the Hurricanes. Erykah Davenport (2015-18) is the other. ... Miami finished 17-3 at home, tied for the second-most home wins in a season in school history. Mompremier's 22 rebounds tied for the sixth-most in an NCAA women's tournament game. The record is 27, held by Anriel Howard in 2016 when she was with Texas A&M. Arizona State is one of 11 schools with wins in both the NCAA men's and women's tournaments this season. The others: Baylor, Buffalo, Florida State, Gonzaga, Iowa, Kentucky, Maryland, Michigan, Michigan State and Oregon.